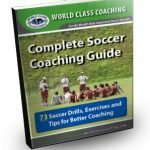 This activity is designed to encourage dribble penetration through the field when space is given. Teams who recognize space for speed dribbling will force defenses to make decisions based on the attacking team. 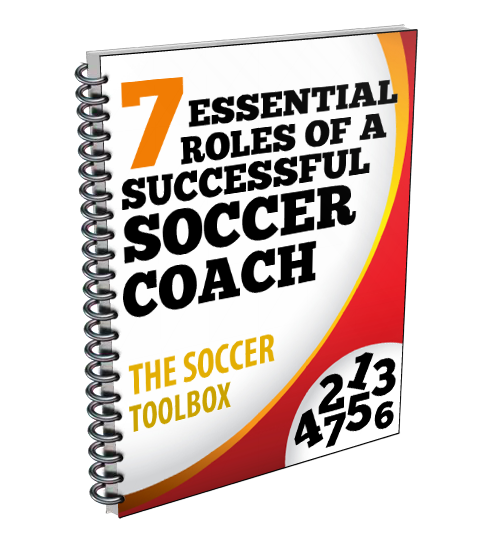 It will be more likely that advances into more dangerous spaces on the field will occur. Two grids are set up in 25 yard squares approximately 20 yards apart. Two color groups are set up so that each grid has 5 vs. 3 occurring in each grid. Each grid plays keep away with the group of 5 retaining the ball. When the defense group of three gets the ball they attempt to retain as long as possible. On the coach’s whistle an attacking player from grid A speed dribbles to grid B and continues to play keep away in the new grid. A player from the sideline joins grid A and the same activity continues. On the same coach’s whistle that initiated the grid switch a player from grid B speed dribbles out of that grid and takes a shot on the goal and then joins the line for grid A. Keep both color groups the same for two separate timed games where score is kept for each successful goal scored after exiting the grid. 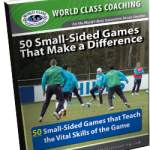 World Class Coaching offers a wide variety of resources to help coaches. Here are two free resources that the are offering.